Our project consists of alterations and additions to an existing 1980’s home on Solomon St in Mosman Park. 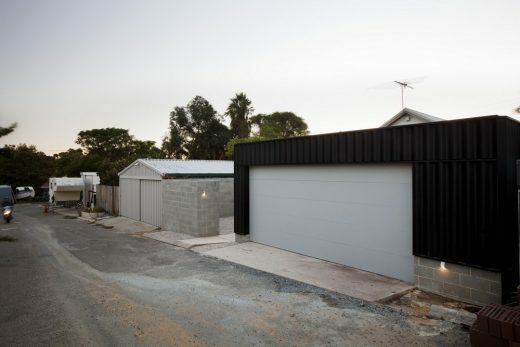 Our brief was to add a double garage off a rear laneway, augment storage, reconfigure the existing master bedroom, increase the size of existing minor bedrooms, and refurbish existing bathrooms. The budget was $200,000.00, construction cost marginally more. 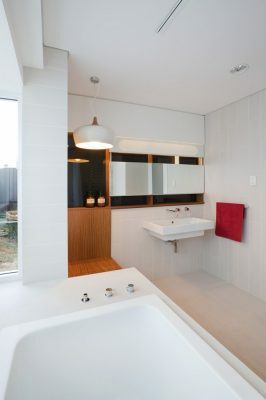 The project was phased, with bathroom renovations comprising stage 1 (owner build) and the balance, stage 2 (registered builder). 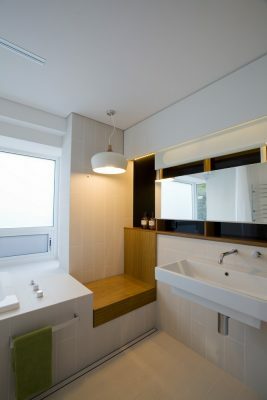 With exception of bathrooms, the briefed program was to be located to the rear of the existing home, in order to establish a connection with the existing service lane. We therefore conceived of the addition not as growing out of the existing architecturally designed home, rather as an element that comes at the home from the laneway.. collides and embeds itself into the fabric of the existing. This element is given the form of a box to keep it visually distinct from the pitched roof of the existing. 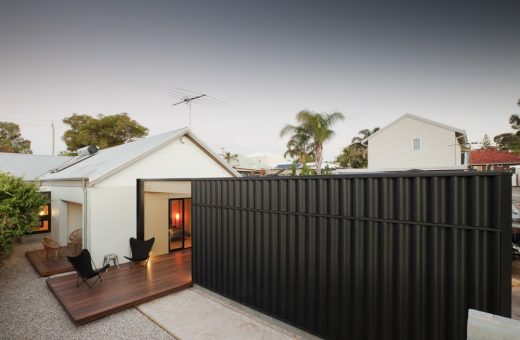 It is further differentiated by cladding it in ‘supersix’ fibre cement sheeting – a language borrowed from the nearby laneway fencing – and painting it black. The master bedroom previously terminated a narrow corridor of the original house. It was full-width and oversized. Its north-facing windows were unshaded and there was no access to the parking bays at the rear. By orchestrating an offset collision between the new and the existing, we were able to i) create a north-facing verandah for the master bedroom to shade windows, reduce the latter to a more appropriate size, create a corridor for garage access, introducing a surprising termination to the narrow corridor. 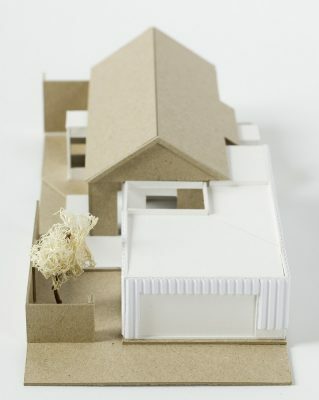 The addition is punctured in its centre by a courtyard that provides spill-out space for a new store / workshop and amenity for the reconfigured master bedroom. It has been envisaged as a carved out space and is treated visually distinct from the black exterior. Bay window seats were added to existing minor bedrooms to increase perceived space and provide a space for sitting and reading. 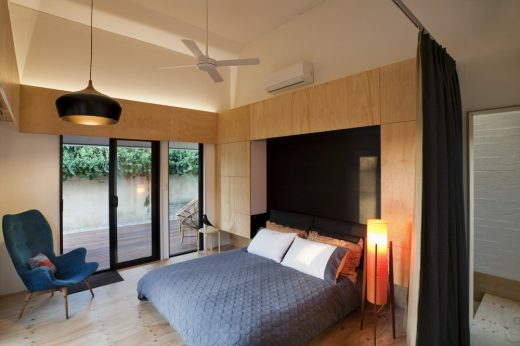 Original cabinets from the master bedroom were reconfigured for use in the minor bedrooms, appropriated to their new locations with sections of contrasting infill joinery. The extension was constructed in an insulated sandwich panel (SIPS) for reasons of cost and time reasons. The system is structural and limits the use of structural steel to large spans only (eg: garage). 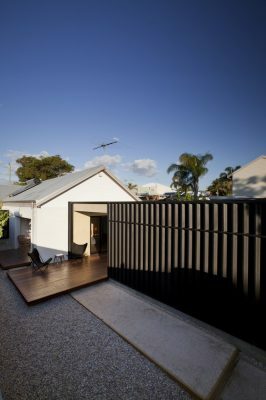 The shell was constructed in days, minimising obstructions to the laneway and overall intrusion to the client, who occupied the house during construction. All windows were off-the-shelf double-glazed units from Bunnings. The exterior comprises two decking platforms, a path made of compacted gravel fines, and an expanse of rainbow stone otherwise. 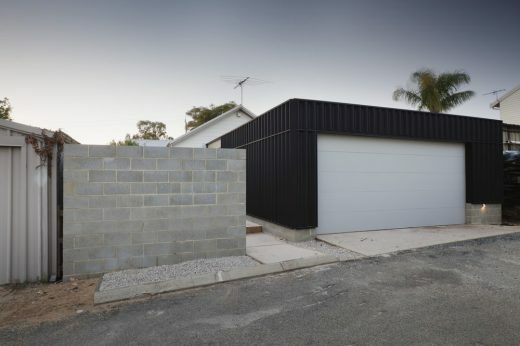 A concrete blockwork wall encloses the yard, and a perforated metal gate gives access to and from the laneway. We believe an inherent sustainability exists in alterations and additions projects in the lifeline they throw to existing buildings and the continuity they offer from a familial and social perspective. 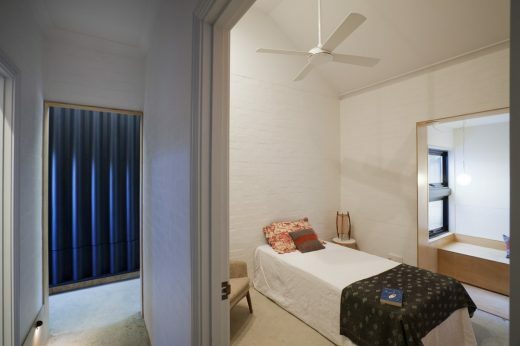 Our clients had lived at their Solomon St home for 28 years prior to undertaking this project. Their commitment was to equip it for the next 10. Our brief was to remedy the ways in which the home was no longer synchronised with the lives within. In doing so we addressed climatic, spatial and functional deficiencies. The addition comprises a garage, storage areas, reconfiguration of the master bedroom, bay windows to two minor bedrooms as well as refurbishment of two bathrooms. The addition was constructed of SIPS, an insulated sandwich panel for speed of construction (minimising disruption to clients), environmental and cost reasons. Windows are off-the-shelf double glazed units from Bunnings. 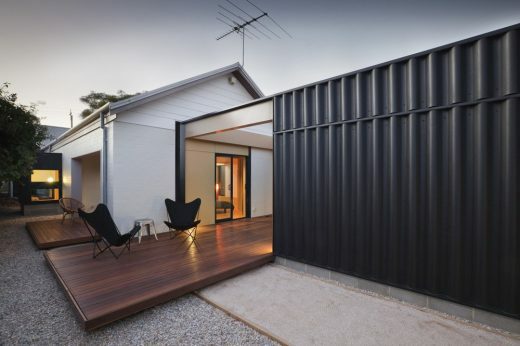 The addition consists of a ‘box’ that intersects with the existing house. It is clad in a material that is vernacular to the right of way to the rear of the house. 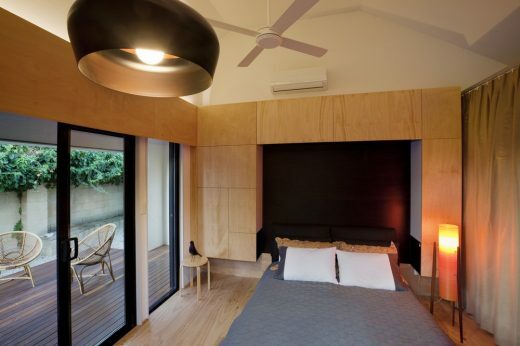 Internally the project salvages cabinetwork from the reconfigured master bedroom and re-appropriates these for the minor bedrooms, tailored with sections of new cabinetwork. Bay window seats are added to existing minor bedrooms to increase sense of space, improve solar access and cross ventilation, as well as offer opportunity for proximity to the outside. 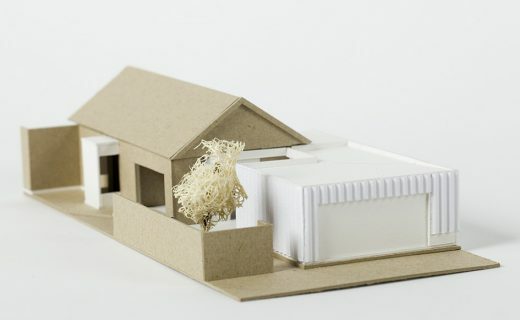 Our project comprises alterations and additions to a 1980s architect-designed house, which for the past 28 years our clients have called home, and forms the most recent in a string of accretions and revisions that has maintained the relevance of the dwelling against the backdrop of a changing family dynamic. 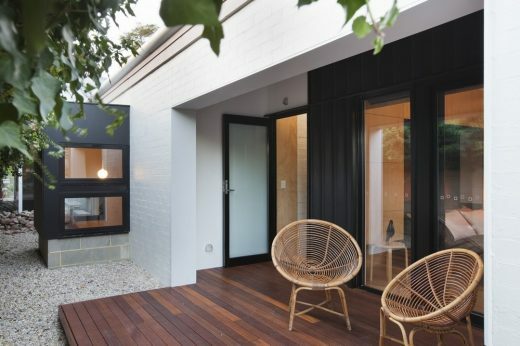 The current brief was to overhaul the rear end of the house to vastly improve its interface with an existing laneway, adding a garage, storage areas, reconfiguring the master bedroom and remodeling associated external areas. Presented with a tight budget and the prospect an owner-builder client, our approach was to create an addition that was simple in form and delivery. We employed a supply + install sandwich panel construction system (SIPS), a rectilinear form, an off-the-shelf double glazed window system, and vernacular cladding materials in an attempt to manage cost and complexity. This strategy aligned itself with our desire to create a strong distinction between new and existing. By referencing the vernacular of the adjoining laneways, we sought to avoid this distinction becoming arbitrary. 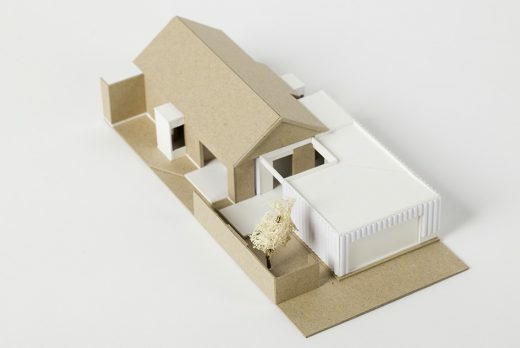 The result is a rectilinear volume not unlike proximate garages, clad in a readily available and common fencing material, the ubiquitous corrugated fibre cement (super six). 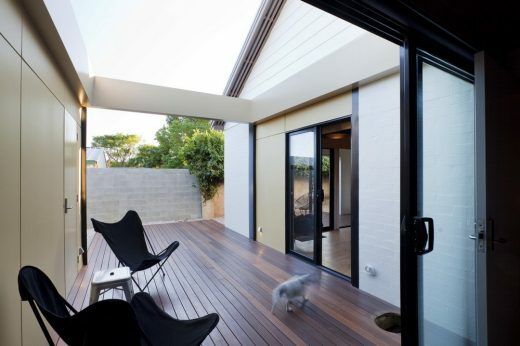 The extension originates from the laneway landscape, and collides with the more domestic architecture of the existing dwelling to create a series of new spaces and interstices that fulfill the brief and create new encounters.